2019 Ireland Legacy Golf Tournament | Glenwood, Inc.
Mark your calendar for Glenwood’s 27th Annual Ireland Legacy Tournament on Monday, May 6. 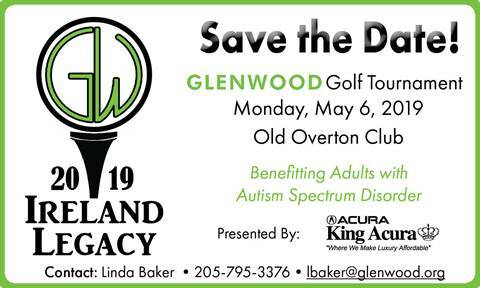 Thanks to the help of our sponsors, this long running golf tournament raises more than $100,000 each year for Glenwood’s programs for adults with autism spectrum disorder (ASD). It is named in honor of the Ireland family and in memory of Kitty, Kathy, Bill Sr., and Glenn Ireland. The Ireland family were instrumental in founding Glenwood 40 years ago to serve individuals with ASD and behavioral health needs in Alabama. The tournament will be held at Old Overton Club with the shotgun start at 11:30 a.m.
Special thanks to our returning Title Sponsor, King Acura, who has supported Glenwood for over 10 years! The golf tournament is a sell out event. If you are interested in reserving a team, contact Linda Baker at lbaker@glenwood.org or 205-795-3376.